Hello and welcome to exampundit. 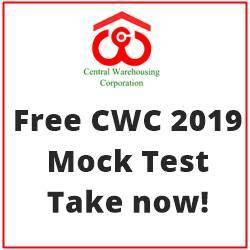 Today we are sharing a Quantitative Comparison Quiz for Bank Exams. The Quantitative Comparison questions are coming in Bank PO Examinations in 2018. In order to help you prepare better, we are sharing first set of Quantitative Comparison Quiz for Bank Exams. 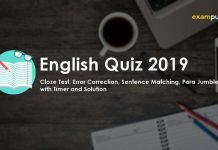 The following Quiz set has 10 questions on Quantitative Comparison with 10 minutes in hand and detailed explanations. 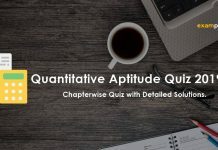 Here is a set of Quantitative Aptitude Quiz based on Quantitative Comparison questions for upcoming Bank Exams. Quantity- 1: A metro rail covered a distance of 1235 km in 19 hours. The average speed of a bus is four fifths of the average speed of the metro. What is the distance covered by the bus? Quantity-2: A 320 meter long train crosses a bridge thrice its length in 40 second. What is the distance covered by train in 8 hr? Quantity- 1: A committee of members is to be formed out of 4 students, 3 teachers and 2 staffs. In how many different ways can this be done provided the committee comprises 2 students, 2 teachers and 1 staffs? Quantity-2: The number of ways of selecting 5 members from a committee of 9 members? Quantity- 1: If each edge of a cube is increased by 50% then by what amount of % will the volume of the cube increase? Quantity-2: An open box is made of 4 cm thick wood. Its external length is 1.56 m; breadth 1.26m and height 84 cm. Find the cost of painting the inner surface of the box at the rate of 40 paisa per sq m.
Quantity- 1: Rajesh got 68 marks in English, 72 marks in science, 65 in Sanskrit, 74 marks in Math and 58 marks in Hindi. The maximum marks in each subject are 80. What is his overall % of marks? Quantity-2: Mukesh walks 180 metres every day. How many km will he walk in 3 week? Quantity- 1: 12 years ago the age of Barkha was 4 times that of Sourav’s. After 12 years Barkha’s age will be twice that of Sourav’s. What is the age of Barkha 8 years ago further? Quantity-2: A certain number of pens were purchased for Rs. 288. Eight more pens could have been purchased for the same amount if each pen was cheaper by Rs. 6. What was the number of pens purchased? Quantity- 1: The area of a rectangular park is 1715 sq metre. If the length of the park is 40% more than its breadth, find the perimeter of the park. Quantity-2: If the area of a square garden is 1936 sq metre, find the perimeter of the garden. Quantity- 1: The diff between the present age of Riju and that of Romi is 20 years. 16 years ago the ratio of their ages was 2:1. Then after 8 years what will be the age of Riju? Quantity-2: Menasha’s present age is 42 years. After 4 years what will be the age Jennie if Jennie is 3 years younger than Menasha? An urn contains 5 red, 3 blue and 4 green balls. Quantity- 1: The probability that none are blue, if 3 balls are drawn randomly. Quantity- 1: What least number should be added to 14160 so that it becomes a perfect square number? Quantity-2: By how much is two fifth of 180 greater than three fifth of 115? Quantity- 1: A person runs the first 7/20 part of a distance at the speed of 2.5 kmph, the next 2/5 of the distance at a speed of 2 kmph and the remaining distance at a speed of 1.25 kmph. The average speed of this person. 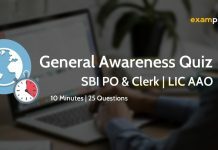 The Quantitative Comparison Quiz is the quantity 1 quantity 2 related questions came in SBI PO.